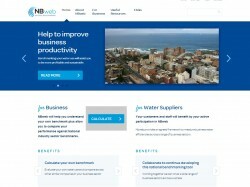 The National Business Water Efficiency Benchmark (NBWeb) Tool provides a standardised approach to measure business water usage across a range of ‘like’ business segments. By understanding your benchmark and the uses of water or processes that contribute to it, you may be able to improve productivity and establish a realistic water use production target. This tool is now live and ready to use. Please click on the link below to calculate a benchmark for your business. The website was developed with funding provided by Smart Water Fund and the a range of Australian water utilities and water industry stakeholders.